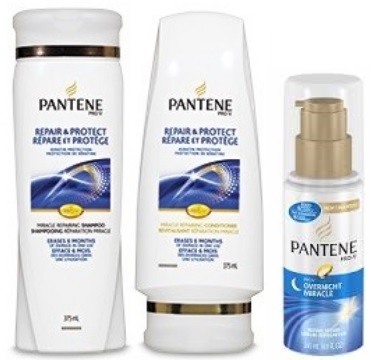 Protein loss makes hair vulnerable to damage but this collection - Pantene Pro-V Repair & Protect contains a formula with antioxidants to reduce protein loss so hair stays strong - and when you use the shampoo and conditioner together, erases 6 months of damage in 1 use! I think it's important to also note that not only will your hair look better, it will also smell fresh and fruity! Repair & Protect Miracle Repairing Shampoo - 375ml - $5.99 - locks in moisture to help repair damaged hair with a unique dual-polymer complex - restoring smoothness, shine and manageability for hair that is healthy and protected from future damage. Gentle enough for color-treated, permed or relaxed hair. Repair & Protect Miracle Protecting Conditioner - 375ml - $5.99 - resurfaces from root to tip to target and repair damaged strands and then rinse away clean for hair that is restored today and protected tomorrow. Gentle enough for color-treated, permed or relaxed hair. Overnight Miracle Repair Serum - 145ml - $8.99 - has a weightless, non-sticky formula that helps resurface hair at it's weakest points to restore hair while you sleep for a healthy looking start each morning. Hair is smooth, shiny, and soft, and there is nothing left behind on your pillow. I am totally obsessed with this serum, after washing the next day, my hair looks so shiny and feels so soft! My caution to other fine haired girls though, if you put it in you have to wash it out the next day or your hair will look limp and greasy. Those with thicker hair can probably get away with leaving it in but I can't so if the alarm fails to go off and you don't have time for a shower, prepare to use a lot of dry shampoo! Available at mass, grocery and drug stores across Canada.